This week I'm in Bandar Seri Begawan, the capital of the Sultanate of Brunei Darussalem (http://en.wikipedia.org/wiki/Brunei) which shares Borneo, the world's third largest island, with parts of Malaysia and Indonesia. Brunei is ruled by (are you ready for this?) Hassanal Bolkiah, his majesty, the Sultan and Yang Di-Pertuan of Brunei Darussalam, Grand Chamberlain YAM Pengiran Penggawa Laila Bentara Istiadat Diraja Dalam Istana Pengiran Hj Alauddin bin Pengiran Paduka Tuan Pengiran Hj Abu Bakar (http://en.wikipedia.org/wiki/Hassanal_Bolkiah). There have been 29 Sultans of Brunei going back to the year 1405. The Sultan is one of the world's richest men and owns extensive holdings of oil and natural gas. He also has what is purported to be the world's largest palace and grounds (http://en.wikipedia.org/wiki/Istana_Nurul_Iman). The Sultan is also famous for his vast automobile collection, having been said to have owned between 3,000 and 5,000 cars: according to The Guinness Book of Records the Sultan's personal collection includes the world's largest collection of Rolls-Royces -- 500 in all. During the 1990s, his family accounted for almost half of all Rolls-Royce purchases, bulk buying slightly modified vehicles for diplomats and adding unique cars to their own collection. He also owns the very last Rolls-Royce Phantom VI, a 1992 state landaulette. Sixty-five percent of the Sultan's 400,000 subjects are Sunni Muslim. The Sultan has shown some religious tolerance by allowing a few churches, temples and shrines (but as of yet no synagogues) to serve foreign workers, businessmen and diplomats. He holds a firm line on alcohol which cannot be purchased anywhere in Brunei. However, in an attempt to build up tourism and to be hospitable, he allows foreigners to bring in small amounts for their own use. The volume is checked closely on the way in and out to try to prevent it from ending up in local hands. During the past decade, the Sultan has led a major effort to modernize the capital with new infrastructure, mosques, restaurants, and a shopping mall. It has excellent roads and its drivers are among the most disciplined in Asia. However, the city is "dead as a door nail" after dark. There is very little crime in Brunei with the following being a possible reason: as my flight approached the Bandar Airport, the purser announced that anyone caught with drugs in Brunei would be punished with death. Seventy percent of working Bruneians are employed by the Government. According to my tour guide, public sector employees typically work 4-5 hours a day with a two-hour lunch break and several half-hour tea breaks. Government employees get interest-free loans to build homes. Brunei residents pay no taxes and receive free medical care and education all the way through university if they remain in the country to work. One of the capital's principal tourist attractions is the suburb of Kampung Ayer (http://en.wikipedia.org/wiki/Kampong_Ayer) with 39,000 inhabitants living in houses on stilts along the estuaries of the Brunei River. The government has provided electricity and plumbing to all of them which are connected through a series of wooden walkways. There are also schools, mosques and clinics on stilts among the homes. 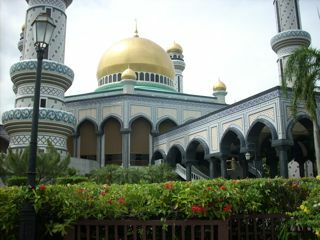 Other points of interest in and around Bandar are the Royal Brunei Museum, the Royal Regalia Museum (http://www.youtube.com/watch?v=AwBc3g4XEFI), several interesting mosques topped with golden domes, and the Palace which can be viewed from afar but can only be visited on special occasions. The primary attraction outside the capital is Ulu Temburong National Park which is reached by boat and is a rain forest preserve for exotic flora and fauna (http://www.ecologyasia.com/html-loc/ulu-temburong.htm). Ok, so there you have it -- everything you always wanted to know about Brunei Darussalem. It's been an interesting place for a few days, but I'm ready to move on.